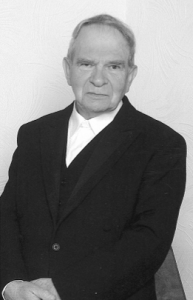 On 29 April 2013 Rev Fraser Macdonald passed away in a retirement home in Portree at the advanced age of 88 years. We believe that his passing was not only from time to an endless eternity but from this wilderness journey to the spiritual Canaan above, the rest that remaineth to the people of God. Mr Macdonald was born on 15 December 1924 in Oban of God-fearing parents. His father was an esteemed elder in the Church and his mother a true mother in Israel whose piety was held in high regard by the Lord’s people. The value of a Christian family as an influence for good is incalculable, and it was under such spiritually benign influences that he grew up – one of a family of 11 children. In his teenage years he came under soul concern. At this time he was working on the family farm near Beauly and came under the ministry of the late godly Rev D A Macfarlane. The preaching of this good and much-used servant of the Lord was blessed to Mr Macdonald and he often recalled with pleasure, and fed again with profit, on the Word as Mr Macfarlane had expounded it. There is no doubt also that Mr Macdonald’s preaching benefited from, and was influenced by, Mr Macfarlane’s highly-spiritual treatment of the Word in the pulpit. Several years later, Mr Macdonald made a public profession of faith in Christ and subsequently professed a call to the ministry. He was accepted as a student for the ministry by the Northern Presbytery and, after gaining an MA degree at Edinburgh University, he followed the Church course in divinty under Rev D A Macfarlane and Rev Donald Beaton, Oban. This was to be Mr Beaton’s last class as a tutor of Theology. Speaking of his student days, Mr Macdonald recalled that, while at an Edinburgh communion sharing lodgings with a fellow student, Alexander Murray, they had worship together after an evening service. They decided to continue to read the Word and pray and, in what seemed a very short time, they found it was time to go out to the morning prayer meeting. On 27 August 1952, Mr Macdonald was inducted to the North Tolsta congregation. He thus became the first minister of that congregation in the Church. Though he was not a native speaker of Gaelic, Mr Macdonald had studied Gaelic prior to his induction and very quickly acquired fluency in preaching in that language. It was in these early years of his ministry that he married Morag MacLeod, a nursing sister who had close connections with the Kames congregation. She was a true helpmeet to her husband in their journey through life together. His earnest preaching to the large congregations which gathered in Tolsta was blessed to a number who professed faith in his latter years in that charge. In the summer of 1966 Mr Macdonald accepted a call to Portree and on June 21 of that year was inducted there, his brother, Rev A E W MacDonald, preaching the induction sermon from the words, “Come over to Macedonia and help us” (Acts 16:9). Mr Macdonald’s assistance at communions was notable in that professions of faith followed not infrequently from his preaching of the Word at these sacramental gatherings. His prayers, as well as his preaching, were highly regarded by the Lord’s people. Since his death, one member of the Church stated that she would often play over a tape of Mr Macdonald’s sermon to hear his opening prayer. In the wider Church he was Clerk successively of the Outer Isles and Skye Presbyteries, and was for a time Assistant Clerk of Synod with Rev R R Sinclair. His knowledge of New Testament Greek made him a useful member of the Training of the Ministry Committee. In April 2006 he resigned his ministry due to failing health, though he continued to hold services for a time. During his latter years he derived comfort from the words in Job 5:26: “Thou shalt come to thy grave in a full age, like as a shock of corn cometh in its season”. Though Mr Macdonald’s latter years were encompassed with increasing frailty, yet his love of the Word and prayer, and of the company of the Lord’s people were continuing evidences of his being like that shock of corn coming in its season. To his mourning widow, sisters and brothers we extend our warm sympathy. May many servants of a like mind and spirit and gifts be raised up for the service of the Lord! rejoicing shall return” (Ps 126:6).